Fairmont Hotels and Resorts recently rolled out a Facebook contest in coordination with ePrize called Everyone’s An Original Personality that matched fans up to their lifestyle interests to help define their travel personality. “We’re always looking for fun and creative ways to engage with our fans and followers,” shares Andrea Johnson, Executive Director, CRM at Fairmont. With the travel personality quiz approach, Fairmont was able to showcase its celebrated collection of luxury hotels and some of the amazing experiences they offer travelers. The quiz consisted of five questions each with the choice of five different answers that asked fans to select their favorite beverage, weekend escape, idyllic dining experience, best form of transportation and idea of beauty. Each question was paired with a photo to help participants envision which answer fit their personality and if they leaned toward the adventure, exotic, leisure, sophisticate or urban type of lifestyle. The Fairmont said it has been a very successful initiative to date and they’ve surpassed the number of entries they’d expected. The contest is easy to enter (enter here) and features a number of luxury prizes. Enrollment has been high and they’ve received excellent feedback from their fan base. In exchange for fans sharing their email address participants are entered into the contest with the chance to win a seven-night stay for two people and a $400 gift card to use toward hotel spa services, resort activities or dining credits. Johnson says this additional insight ensures every experience with their brand is an original one. The more Fairmont comprehends the motivations and passions of either prospective guests or current guests, the better they can provide them with benefits, services and offers that suit their travel preferences. By getting into the minds of Fairmont fans and finding out what types of vacations tied to their travel value systems the hotelier was able to label each fan one of five travel style types. By classifying each entrant Fairmont now has the ability to segment the list of contestants that shared their email addresses and create custom email messages to each participant’s email in future communications. “One of the most important and challenging aspects of email marketing is to provide the highest level of relevance possible, says Chris Sietsema, Social & Digital Operations Lead at Convince & Convert. According to the MarketingSherpa Email Marketing Benchmark Report, 32% of marketers say segmenting their email database is one of their organization’s top objectives in the next 12 months. Fifty two percent say they have a great need to improve email database segmentation. And with the crush of hundreds of communication pieces daily in consumers’ lives, staying relevant is important to get past the email open gates. “Relevancy in email is key in getting subscribers to engage and get excited about receiving email from you,” says David Hibbs, Senior Strategic Consultant at Responsys – an international email and digital marketing agency. 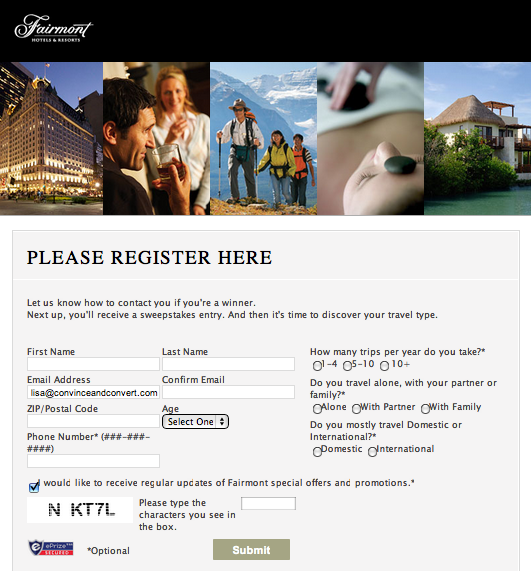 While Fairmont is not the first brand to develop contest quizzes to segment its audiences – Wildfire Interactive and other Facebook application developers have developed these types of contests for several of their clients – their campaign was effective in several ways. It not only provided Fairmont with the coveted customer email, but also gave fans a moment of escapism to daydream about their next potential vacation — one that might find Fairmont attached to their itinerary. Johnson closed by saying in the future the behavioral preferences captured (through these types of campaigns) will lend to opportunities to tailor communications through the message, offer creation and creative that will be both relevant and personal. It’s great to see luxury brands recognizing all luxury clients are not created equally. Fairmont is doing the work to customize their marketing communications, and it will pay off in the future as they continue to build their daily relationships with their fans and customers through both digital and in-person communities. Lisa Loeffler is Research & Analysis Lead at Convince & Convert. She is also founder and principal of Genuine Media, a marketing agency that helps clients build their individual and brand reputation through social media.